It was a picture perfect sunny day for our Game of SKATE contest. The Game of SKATE was setup today June 3rd as a part of Sault Ste Marie's On The Move day which is part of the ACTIVE 2010 initiative. There were plenty of good tricks thrown down today. Some tricks were tech some were more snowboard-esque like Logan's Indy Grab off the handi-cap triangle ramp to win his round SKATE. 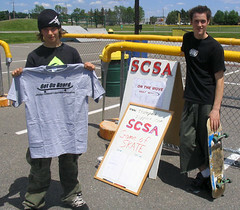 Logan Gibbs is shown here holding his prize of a cool new SCSA "get on board" t-shirt. To the left we have the last skater to be eliminated, Bradley Charlebois. We ran two separate Games of SKATE. One Game included all ramps, rails and flatground where the second game was the more classic style of flatground tricks only. For the flatground game Tom Rouse took the title of 1st and a new T-shirt. Followed close behind were Matt D'ettorre and Kaleb Demour. This game was a thriller with all the riders trying hard to win. Kaleb came out of the gates at the beginning with round after round of tricks that nobody else could land. Most thought he had the game in the bag, but the tables changed once Kaleb lost his spot with a bobbled nollie shuv-it. 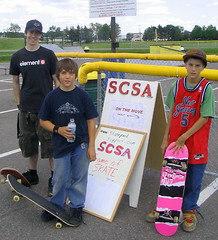 Overall it was a great day with a few great games, and plenty of great kids just having some fun on their skateboards. Visit www.sootoday.com to see a few more photos and a mention in the ON THE MOVE - Active 2010 news article. Ah! Was it posted on this site that this was happening? Didn't even know it was going on...oh well. Looks like you guys had fun. if you click on matt's name (the one who posted) he has a link to his site.